Theresa May has been granted an extra two weeks to come up with a Brexit solution after talks with EU leaders. "The UK government will still have a choice between a deal, no deal, a long extension or revoking Article 50," he said. "The 12 April is a key date in terms of the UK deciding whether to hold European Parliament elections. "If it has not decided to do so by then, the option of long extension will automatically become impossible." Mrs May ruled out revoking Article 50, which would cancel Brexit, and she also said "it would be wrong" to ask Britons to vote for candidates for the elections to the European Parliament, due to be held from 23-26 May, three years after they voted to leave the EU. The UK's departure date is still written in to law as next Friday, 29 March. 12 April: If MPs do not approve the withdrawal deal next week - "all options will remain open" until this date. The UK must propose a way forward before this date for consideration by EU leaders. Mrs May is expected to table secondary legislation - that has to go through the Commons and the Lords by next Friday - to remove 29 March from UK law. But Downing Street sources say an agreement with the EU to extend the Brexit deadline would be a piece of international law and would take precedence even if Parliament rejected it. Mrs May said MPs had a "clear choice". Speaking on Thursday, after waiting for the 27 other EU countries to make their decision at a summit in Brussels, the prime minister said she would now be "working hard to build support for getting the deal through". The withdrawal deal, negotiated over two years between the UK and EU, sets out the terms of the UK's departure from the bloc, including the "divorce bill", the transition period, citizens' rights and the controversial "backstop" arrangements, aimed at preventing a return to border checks between Northern Ireland and the Republic of Ireland. Senior Labour MP Hilary Benn has also said that he will table an amendment on Monday, enabling MPs to hold a series of "indicative votes" on Wednesday on alternatives to Mrs May's plan. He said these could include a free trade agreement, a customs union and a referendum. He told the BBC the EU's decision was "a case of crisis delayed, not crisis ended" as it still looked unlikely that Mrs May's deal would be approved. "We cannot have a no-deal Brexit in three weeks' time," he said. The government is also exploring with opposition parties the idea of holding "indicative" votes on alternatives to its own Brexit policy, in an effort to retain some control over the process. Plaid Cymru's leader at Westminster, Liz Saville Roberts, who has been taking part in the talks, said: "The government is now openly exploring a process to allow Parliament to take control - an effective admission that they have lost all authority. "We will be continuing to push for a People's Vote as a way out of this Brexit mess." At a news conference on Thursday night, Mrs May also struck a conciliatory tone when she referred to her speech from Downing Street the previous evening, which had sparked an angry reaction from MPs after she blamed them for the Brexit deadlock. "Last night I expressed my frustration and I know that MPs are frustrated too," she said. "They have difficult jobs to do." 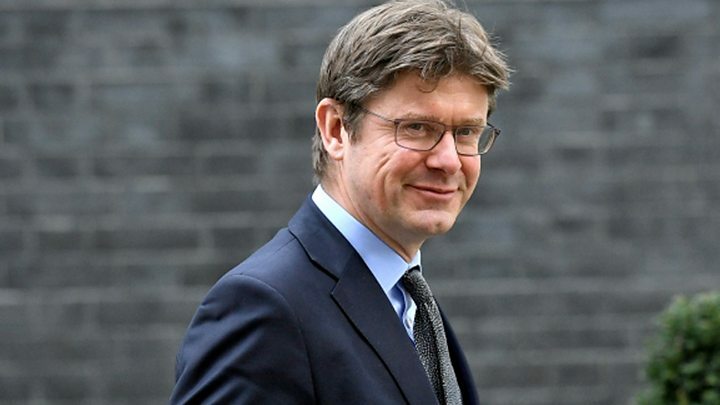 Speaking to Nick Robinson's Political Thinking podcast, Business Secretary Greg Clark said that speech "clearly wasn't a great success". "I don't think it was helpful in resolving the matter. But, listen, none of us is infallible and even prime ministers sometimes don't get the tone quite right," he said. It comes after a petition calling for Article 50 to be revoked passed three million signatures. A march demanding another referendum is also planned for Saturday in central London. In her briefing to journalists, Mrs May dismissed calls to revoke Article 50 - the process by which the UK leaves the EU - which would mean Brexit is cancelled.